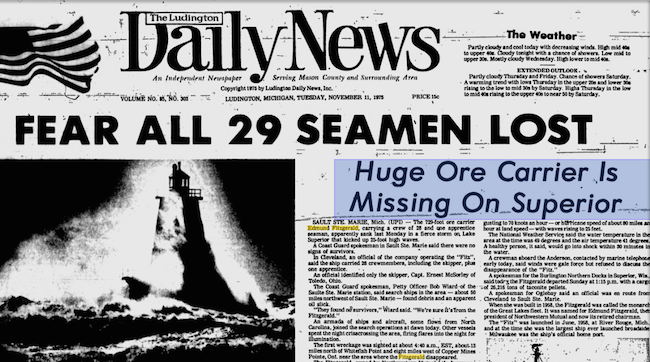 Forty years ago, on November 10th 1975 an American Great Lakes Freighter vanished from Lake Superior. 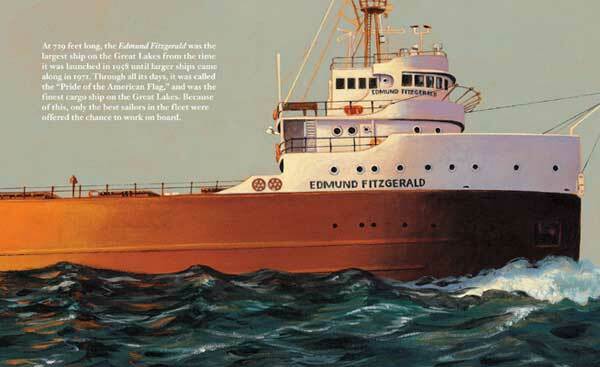 Named after its president and chairman of the board, Edmund Fitzgerald, the ship touched waters for the first time in 1958 and was the largest ship in the Great Lakes. The great ship used to carry taconite iron ore from the mines near Duluth, Minnesota to iron works in Detroit, Toledo, and other Great Lakes ports. It continued to do so for seventeen years until it disappeared in the storm of November 10th. On the afternoon of November 9th 1975, Fitzgerald was carrying a full cargo of ore pellets Superior, Wisconsin, near Duluth to a mill on Zug island near Detroit, Michigan. Captained by Ernest M. McSorley, the ship was joined by another freighter, SS Arthur M. Anderson when it was caught in waves up to 35 feet high. It is believed that Fitzgerald wasn’t able to cope with the storm and sank in the waters of Canada at around 7:10 PM. The ship was lost about 17 miles (15 nautical miles; 27 kilometers) from Whitefish Bay near the twin cities of Sault Ste. Marie, Michigan, and Sault Ste. Marie, Ontario. It had a crew of 29 people, no bodies were found. The last words recorded from the ship were from Captain McSorley which said “We are holding our own.” News started spreading about Fitzgerald and all NEWS publications mentioned as the ship was missing. Nowhere was it mentioned that the ship has sank. Many theories came forward suggesting what happened to the ship. There was NEWS of the wreck being found but no one still knows the exact cause of the incident. Some also believe involvement of Aliens and abduction of the 29 crew members. The Alien or the UFO theory was backed by the fact that dead bodies do not float in Lake Superior. The cold water slows decaying of the bodies and this allows the bodies to stay down at the sea bed. Hence, the chances of bodies being floated away with waves are minimal. When no bodies were found, it was believed that an UFO or aliens might have taken away the crew. The last attempt to search for more bodies and wreckage was in 1995. Later, Canada placed a prohibition on all diving activity to preserve the area as a grave site for the 29 men who died that night.